The Beurer FCE90 Pureo Skin Care System is one of the most advanced and effective home beauty treatments available today - salon results in the privacy of your own home! Would you like beautifully radiant skin from the comfort of your own home? This is now a reality with the Beurer FCE90 Pureo Skin Care System. Engineered to give you the most nourishing skin experience yet, this highly advanced treatment system will give you that flawless celebrity glow. The system uses positive and negative ions plus hot and cold treatments to cleanse, tone and revitalise skin. Included is an Advanced Hydro Lift Cream and a Cleansing Milk, both of which are formulated to be used with the Pureo device for the best results. In a clinical study, 82% of people reported that they had smoother skin and 88% said their skin felt fresher and healthier. So what are you waiting for? First, remove impurities from the skin with the Cleansing Milk, which has been specially formulated with active agents which have ionic function. When used with the ionic Pureo device these active agents can be worked deep into the skin where they then draw out dirt and impurities. This leaves your skin feeling fresh and revitalised, and makes your complexion look brighter and more radiant. The second step involves the Advanced Hydro Lift Cream which works to deeply hydrate the skin. When used with the ionic Pureo device the cream infiltrates deeply through the tissues, leaving the skin thoroughly moisturised and smooth. Plus, by hydrating the skin you will help to prevent wrinkles and lines. The third step is using the activating heat function on the Pureo device. By applying heat to the skin you will increase circulation throughout the tissues. The increased blood flow helps to bring oxygen and nutrients to the skin cells in order to increase cellular activity and health. The skin will feel softer, more supple and will be healthier. Finally, use the vitalising cooling function to freshen and firm up the skin. Pores will be minimised to help the skin look smooth and fresh and the skin itself will be toned and firm to reduce the appearance of wrinkles and fine lines. Smoother skin - but that's not all! Your skin will be glowing for joy! Can you really afford not to have this home salon-style treatment at your fingertips? 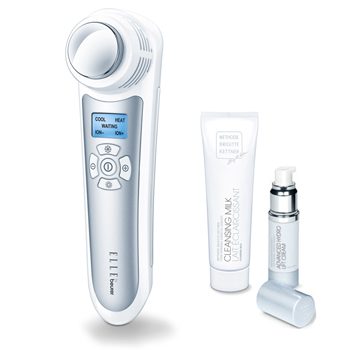 With an LCD display and simple 5-button control, the FCE90 Pureo Ionic Anti-Ageing device is really easy to use at home and it has clinically proven results. It is part of the Elle by Beurer range, a collection of products created by leading health gadget manufacturer Beurer in conjunction with style and beauty gurus Elle.